On the new Lufthansa website you can put together your own virtual Boeing 747-8 (the latest generation of the new jumbo) from digital 3-D components. This sounds similar to a really neat site Boeing had a while back where you could Design Your Own Dreamliner which was addicting and lots of fun! By registering on the Lufthansa 747-8 site you will have an opportunity to win 2 tickets to fly on the new 747-8 and some other prizes! 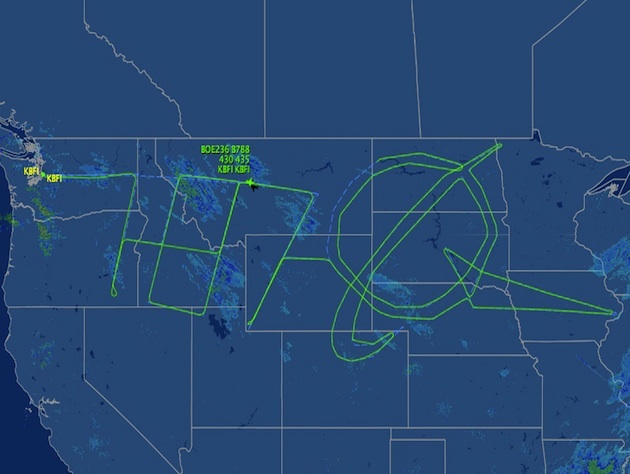 A Boeing 787 Dreamliner taking a 19 hour test flight across North America drew the numbers 787 followed by the company logo across several thousand miles of sky. The numbers and logo were not visible from the ground but could be seen in the flight plans. Star Alliance added some great pictures of the ANA Dreamliner from Saturday January 21 2012 as it saw the first passenger long haul flight from Tokyo to Frankfurt. Some photos are from a ceremony held at Frankfurt Airport celebrating the Dreamliner’s first departure back to Japan. How would you like to design your own Boeing Dreamliner? Designing the Dreamliner is a lot of fun and can be addicting! The site gives you a 360 degree view of the plane which is really neat. You can choose different colors, use paintbrushes, add various Boeing graphics & add text to customize your Dreamliner. You can also change the background for the page. When you are done designing your Dreamliner, you can add your creation to the gallery. All submissions are subject to approval & require a minimum 24 hours to post.